What is the first thing that comes to your mind when I say "Street Food"? For me, I think of comfort. I remember the days when I was living in Qatar or vacationing in India or even when I visit my parents in Dubai, street food was always one of the highlights. You see in Asia and in the Middle East the notion of street food is not as we know it here in Europe or in the States. No! Going out with friends to the beach side promenade for a walk or the bazaar and enjoying the multi-cultural, multi-colored foods offered was an event. An event that one dresses up for, gets together with friends and go out to have a blast. In Europe I realize that street food is more or less considered as a quick lunch or a take away. Just something where you can get a huge portion for little money. I loved spending the evenings with my family in Bombay on the beaches of Juhu. Not a brilliant place to swim but fantastic when you wanted to eat some scrumptious Bhelpuri or Panipuri. Of course I cannot forget the juice stalls in Doha. Thursday nights (the weekends were Thursdays and Fridays) were not the same if we missed out starting or ending our evening at one of these little stalls on the beach promenade. After a party with all my friends we'd head on over for fresh fruit juice and awesome sandwiches and pasta. Then of course strolling the Al Riqqa Road in Dubai with Tom and other friends, where food was available like sand on a beach. Everything from Arabic, Indian to Chinese cuisine as far as the eye can see. Everyone polished up to a tee, in their best outfits laughing, joking and enjoying the simple pleasures of life. The aromas of mixed spices and freshly cooked food in the air. SIGH! Street food for me is certainly not to be mistaken or compared to the fast food joints one goes to. For those thinking "Is it clean? Is it fresh?" Let me tell you that these places depended on their clientele and offering a clean location and fresh food means everything for most of them. Most of these places used fresh ingredients that were bought at the local market on the same day. I loved a little Asian place in Dubai that I just have to visit every time I am there. The people there already know me and what I like and as soon as they see me ask how I, Soeren and Tom are doing. How things are in Germany and so on. Then they get to work preparing my Chinese Spicy Vegetable Noodles. They also have a few tables and chairs set out on the promenade right next to the famous Dubai Creek with a great view of the Dubai city skyline. The things you order are actually served in proper porcelain dinnerware. A luxury class chinese street food locality! Well pretty much everything tastes delicious, but those Spicy Vegetable Noodles are the best. Complete with crisp vegetables and eggs. After you have eaten one of their huge portions you just sit back and this satisfying and comforting feeling takes over. What could be more perfect for Ivonne and Orchidea's one off event where the theme is Dishes of Comfort. I found this great link from Wikipedia about street food and thought it would interest you too. I went to work trying to remember the ingredients added into the dish. I rolled up my sleeves, got out my wok and started the comfort procedure. Sugababes - Easy - New on my iPod and a brilliant song. Cook the Mie Noodles according to packet instructions. In the meantime heat up your wok and add a touch of neutral oil. Add in the chopped chillies, onions and garlic and sauté for a few minutes until the flavors have integrated well. Throw in the julienne vegetables and mix well. Sauté for a few minutes until the vegetables start getting soft but are still crunchy. Drain the noodles and add to the wok. Pour in soy sauce, ketjap manis and the sambal according to your taste. Mix well and covered allow for all the flavors to blend with each other, making sure you do not overcook and mixing every now and then. In the meantime add a dash of soy sauce to the beaten eggs and make a thin omelette out of them. Cut in strips and add to the wok. Season with a dash of sesame oil. If you like cooking chinese and other Asian food as often as I do, buy fresh vegetables in larger amounts and cut these in julienne and freeze in portions. This way you simply need to take out of the freezer and add to any dish you are craving for without having to spend too much time with the preparation. If you like you can add any type of meat or seafood to this. Try, chicken, beef, pork or shrimps for a different flavor each time. Adding crispy fried duck breast makes this into an exquisite meal. Comforting to the core. OK, we do not have the Dubai creek nor do we have the skyline. We have the comfort of our backyard and the warmth of our home to enjoy this lovely meal. It was perfect. For Soeren I made this without the heat of the chillies and he loves his noodles. He loved the flavors this style offered. Tom enjoys hot Asian food and this was a huge treat for him. It is a quick and easy meal to prepare and has all the flavors that one craves for. Something for the entire family or just for you alone. I ate the leftovers the next day sitting on my huge sofa with a steaming bowl in my hands. How many of you are in Bond fever? Now that was a change of subject! Well the new 007 flick premiers here next week and we are getting tickets for it. I can't wait for it. I am a die hard Bond fan since I was a kid. Have any of you already seen it? Nice pictures. Sure will give this recipe a try. Egg Mie Noodles - are these normal noodles?? WOW!! A great recipe. Thanks girl and have a great day. I linked your Monthly mingle in my post:)Thank for reminding me..
Lovely entry for 'Dishes of Comfort', street food does have a different connotation in asia than in the western world, except for fairs and food events, where I'm always looking out for funnel cakes :), comforting? absolutely. 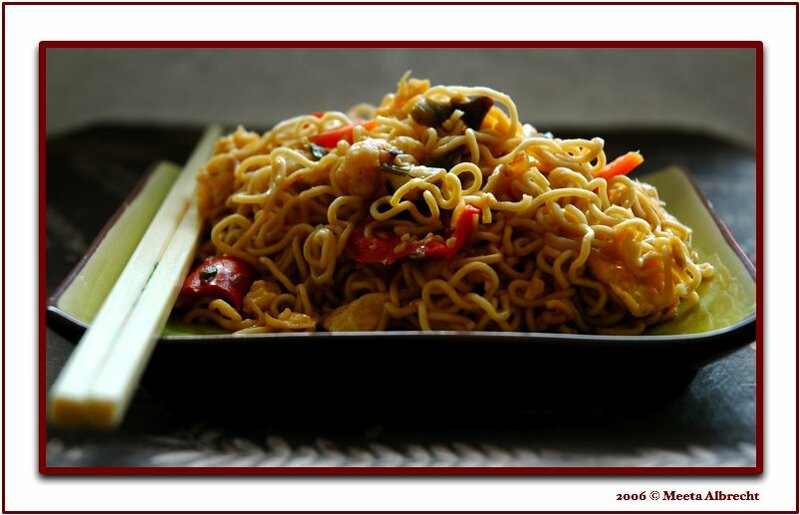 The noodles look lovely Meeta, and street food surely is comforting to many. For me its Chaat !! Though we can re-create the dish at home the street ambience near the stalls is just great !! And like Spandana, I've never heard of Ketjap Manis and Sambal Oelek. Would you be able to post pics of them ?? What is ketjap manis and where can I find it? Is there a way to prepare at home? Sambal is from Malay cuisine, isnt it? I wish I could taste this. It sounds fantastic. I'm also interested in your info about the Asian ingredients. I can get most of those things here, but don't know much about cooking with them. Yum!! I love street food. And I've never gotten sick--like you said, word of mouth would kill any place that made people sick. Your recipe looks wonderful. what a wonderful post! You've made a good point in differentiating street food from fast food. You noodles filled with beautiful Asian accents, I'm really longing for one, at a beach, with my scandles, and with my friends...! nice recipe with noodles. i am going to link your monthly mingle on my blog. Each time I visit I feel like I'm taking off on a wonderful vacation! Your writing and your photos are always such a pleasure. You are absolutely fascinating and the depth of your food repertoire is amazing! Thank you so much for sharing this dish with all of us! Wow!! !Beautiful snaps...those noodles are so inviting can't take eyes of them,i was just staring at them when i opened your blog.Thanks for sharing the recipe,Meeta. This is an excellent entry! I love noodle and of course street food! They are just great! Like many ppl, I have visited your blog many times but am commenting first time here. The Noodles look delicious and bring back memories of my own college days in Pune where we used to be served this yummy dish in the street side stall! looks like I hit your tastebuds with this one. Well I am really glad for that. Thank you to each of you for your comments and what I liked the best is that this brought you folks to take a trip into memory lane too. I just love it when that happens. 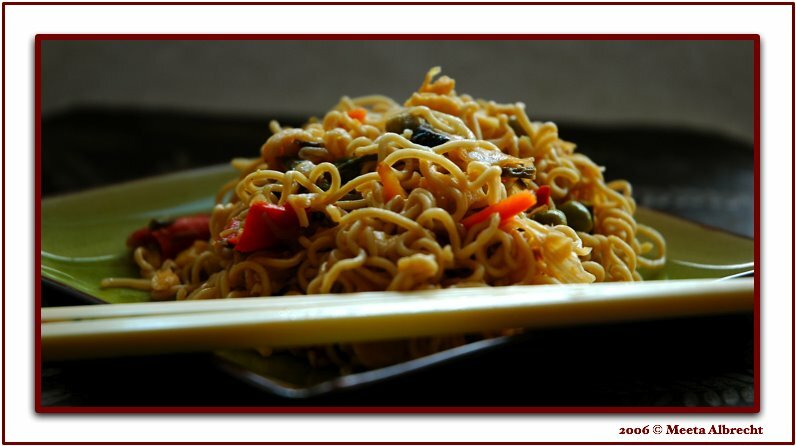 Loved your post Meeta,firstly because spicy veg noodles are a firm favourite and I prepare them oh so often . I even add asparagus tips. And secondly because of the write-up on street food. The one thing I miss the most about India is the Chinese Takeaway which is a stones thow away from my house in Pune. I realised its been more than a year since I visited that. I love the indianised version of Chinese food that they serve. I am sure the Chinese would not have dreamed of all the combos that are available at this takeaway. Your dish looks so delicious!!! Thanks for participating. This is awesome. How did you know that I have been looking for a recipe for Chines noodles? And then you refreshed this post so that I would find it on my bloglines feed? Thanks a bunch! I browsed through looking for "Recipe vegetable noodles". There were tons of recipes on google, but I am so glad I stopped by your page! "Soul Comforting" is the apt expression. Thank you for sharing!! Burp!